It took Dave Otto a disabled list stint, but he finally showed what he could really do, The Associated Press wrote. After giving up 10 earned runs in just five innings of work going into that stint, Otto came out with a six-inning start where he gave up no runs. "I never doubted myself," Otto told The AP after that May 1992 quality start. "I just knew I wasn't pitching up to my capabilities." That year and the year before marked the first time Otto was finally able to show his capabilities. Though he had seen time in the majors each year since 1987, his first four seasons saw him pitch in no more than three games in a single year. Finally, in 1991, Otto started 14 games in the bigs. In 1992, the year he came back from that bad start, Otto started a career-high 16. Otto's professional career began in 1985, taken by the Athletics in the second round of the draft out of the University of Missouri Columbia. Officially at 6 feet, 7 inches tall, Otto had been a baskeball star in high school, according to The Chicago Tribune. He was also all-state in baseball. With his selection by the Athletics, Otto became the second member of his family to make the pros. His father, Al Otto, played three years in the Yankees' system in the 1960s, but never made the majors. 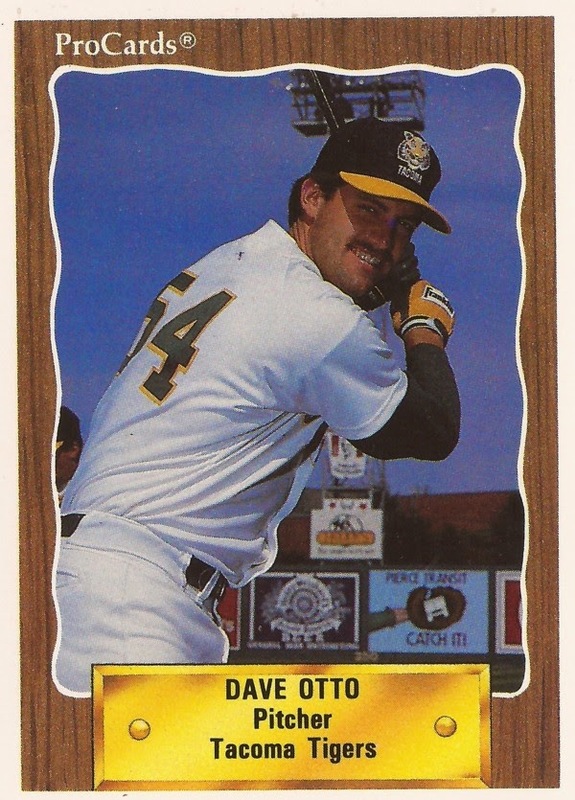 Dave Otto played his first year at short-season Medford. He then moved to single-A Madison in 1986 and then AA Huntsville in 1987. In September 1987, Otto made the jump all the way to Oakland. In three relief appearances, six innings, he gave up six earned runs. He moved to AAA Tacoma in 1988, playing much of that season and the next two there. But he also had his looks at Oakland. Three more outings, two starts, in 1988; one start in 1989 and two relief outings in 1990. Finally, Otto was granted free agency, signing with the Indians for 1991. He got into 18 total games for Cleveland that year, 14 starts. He went 2-8, with a 4.23 ERA. He started that August, though, going 1-2, but gave up just four earned runs, The AP wrote. "It'll come," Otto told The AP of his poor luck, after a game where he reached the eighth, giving up three earned. "I just want to string together some starts. I felt comfortable out there." Otto then got 18 more outings, 16 starts, for the Indians in 1992. His ERA, though, increased to 7.06. For 1993, Otto arrived with the Pirates, taken in the minor league draft. With Pittsburgh, Otto got into 28 games, eight starts, with a 5.03 ERA. Otto then finished up his career in 1994, with his hometown Cubs. He got into 36 games, all in relief. He also posted the best ERA of his career, 3.80. His final game came Aug. 10, his career ending as the strike began.